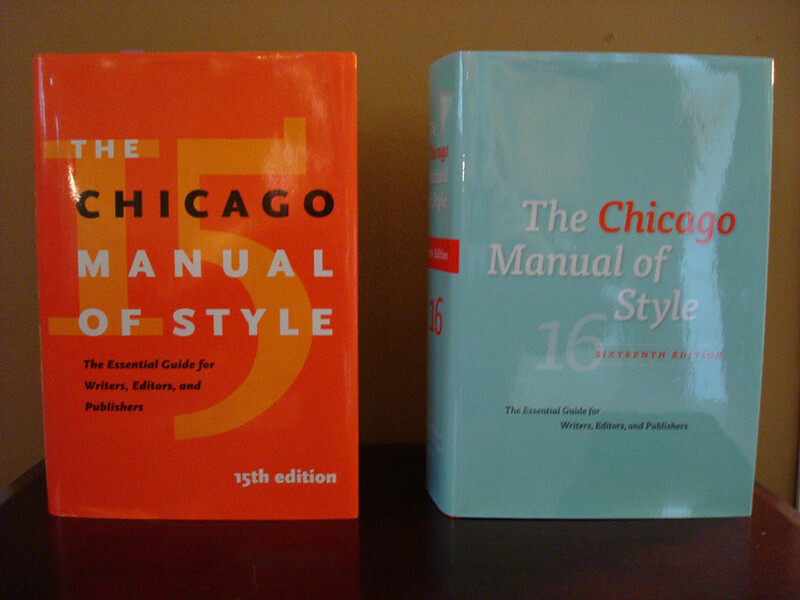 Despite a love of the Chicago Manual of Style (or as I like to call it, “Midwestern Bible”) I’m not very excited to have just gotten the new 16th edition. Last month I bought it from Powell’s and had it shipped to my mom, who schlepped it up for me this weekend. Reluctantly, I gave her my 15th edition to take home and sell back to Powell’s when she has time. To commemorate this historic event, I took a photo of the two compendiums passing in the night. Ol’ 15 and I had some pretty good times. I bought her slightly used for a mere $25, a significant savings off the hefty list price. We worked on the Muhammad Ali Center together–a pretty major undertaking that intimately familiarized me with Chicago. We continued work on many other projects that I still have pride in having been involved with. Despite not being a fan of orange, I loved the bright color and the stylish look and feel of the cover. I used 15 so much I even uncovered (and of course flagged in case I needed to prove) multiple typos inside! While I enjoy how 16 changed Chicago’s standard from “Web site” to “website,” our courtesies ended there, and we’ve been on the wrong foot ever since. I didn’t enjoy not knowing until I had moved to BC that I’d need to buy the latest edition (even though our program doesn’t require us to have the just-released Adobe Creative Suite 5). I had already purchased all my books from Powell’s, and buying 16 required more money ($65! ), and more patience for it to arrive. The dust jacket design is craptacular, sporting a turquoise background for the front cover and spine, and then an abrupt change to orange on the back. Jarring. Sure, I don’t mind turquoise, but the combination of turquoise and orange screams to me that Chicago is trying to be “hip,” like seeing powder blue put together with chocolate everywhere a few years back. After a few late nights writing my 20-page paper this term, I suspect my retinas will be screaming in agony. Goodbye, ol’ 15, I’ll miss you and our warm memories. Just another thing I’ve had to involuntarily sacrifice on this ill-conceived journey.